Currently 49.7% of the world population is using internet and this number is increasing day by day, that’s why in today’s world Website has become your Identity and hence necessity. It make your Business visible word wide, around the clock. It is an old saying “First Impression is your Last Impression”. So Website should always look professional, user friendly and express your business model in its first look. Having a website gives you multiple advantages – Makes you approachable, Increases your business credibility, Provides round the clock business opportunity, Decreases your print material cost, Keeps your customer informed, Targets wider market, Showcases your work, Trust Increases and Cheating on your name gets reduced, Reduces Support Cost and more. Physical Directories have lost their identity, nowadays children don’t even know about it. Whenever anything is needed, we search for it on internet. Many virtual Directories are available but having a website will give your customer full details about your phone no., address, map, product and services and give you an upper hand over your competitor who has mere contact no. and address to show. You met a person in some conference, social gathering etc. who may have a good impression of your work but did not turn up. They later felt you could be useful to them but they don’t know enough about you to have that confidence. With a very little knowedlege about you or your business, person can find you on internet and you get the necessary opportunity you are looking for. When all the details of the business are available on your website, it gives your business some measure of (even a small one) credibility. Your existance is traceable. If you don’t have a website and any doubt arises others find it is very difficult to find some information about you to clear their doublt. If you have a website, anyone can find and see your customer’s testimonial, reviews and rating. After having a website you do not have any bounderies of location and time, your business is visible, approachable round the clock around the world. For example – you have a Garment store, your business is open 10AM-8PM (opportunity is restricated to 10 hrs and for local area only), but when you have an online shopping website you get opportunity extending to 24 hrs and it does not restrict to your local area. Customer can shop any time as per their convinence. As we all know life has become so busy these days person wants to use every minute (traveling time,lunch time, few free minute between work), even time zone( like USA has night when it’s day in india ) does not have any restriction. Company spends a lot in printing brochures and its distribution thereafter. Now your website is your online brochure which is just a click away and always available. You can just push a message with the link of website that will do your purpose and forwarding it from one to other is also very easy thus saving millions of your printing expenditure, moreover it is good for envioornment too. When you recieve an award, how many people will know that you got the award? Few near and dear ones and persons who physically visit your business location. But if you update this news on your website, whosoever comes across to you thru internet (not only in the month or year span but for the years time) will know that your excellence got you an awardt creating permanent impersion and it’s authentication is undoubted. 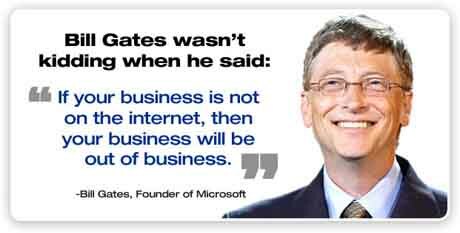 All these thing sooner or later convert into your business opportunity. You display your contact details like email, phone no. and more on your website. Anyone can look into your details and essentially so, you must be having your unique email id with your business name email@mybusiness.com (like sales@anutechdesigns.com ) which no-one else can create. An authenticated business domain name will earn you the trust and the uniqueness of your domain name ensures least misuse or replication of your business id. If you have a business where customer support is needed, you can have a detailed FAQ section on your website. This will effectively reduce incoming calls to your customer support center. Even a customer who purchased your product 5 years back will a have support. Your service calls are reduced and customer has an easy and handy solution.